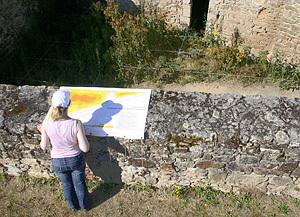 Residence organised by the Loire-Atlantique Departemnet in the castle of Clisson. With the current recognition taken into account of the fragility of environment and the abandonment of the job of weed killers. Vegetation found the way of the ruins. Prendant two in residence, Gilles Bruni accompanied with Arnaud de la Cotte noticed and accompanied this flora and these grasses so often named bad. From their laboratory a plant arrangement appeared, subtle game of landscapes composed of lines, colours, valleys, mountains and caves. 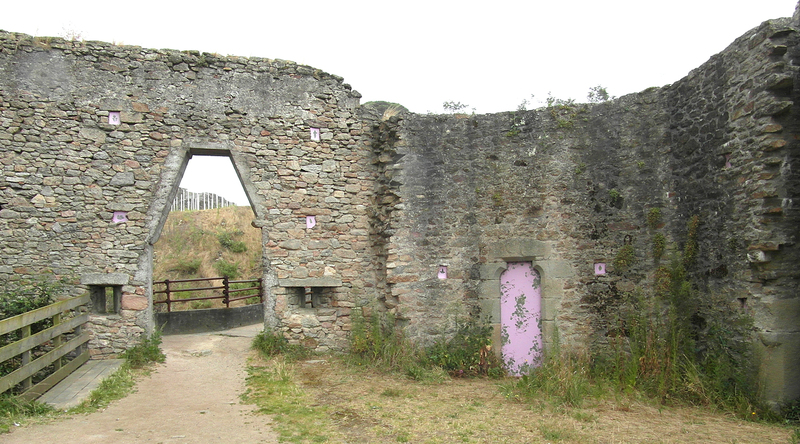 in a medieval castle ruins it, used as plant in plan landscapist of François-Frederick Lemot at the beginning of the 19th century, areas of the castle become the place of interventions often discretes. Dates : first step realised between april and july 2012. Materials: stones, stocks of larch, stems of osier, dead branches harvested by larch, burnt iron thread. Dispositif année 1: 11 stations : The flower beds 2 // The platform of the staking (plants): flags // The bastion of the gardener // Willows put in pots // The Rome's ruin (la ruine-de-Rome ) // The hill in the cairns 2 // The veduta. (double point of view // The valley of grasses 2 // The plant beds // The landscape of Astéracées of the tags // The rock-mountain. 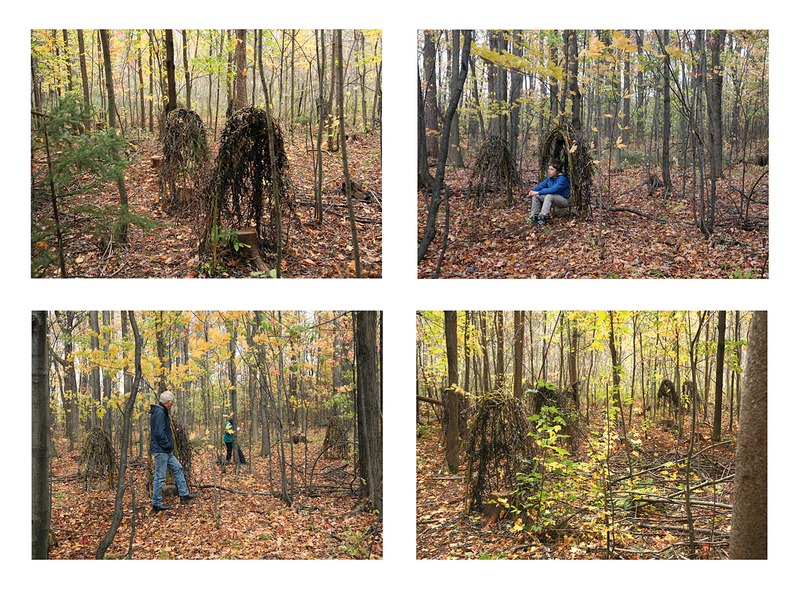 Dimensions of in situ: variables, undetermined: installations divided inside the castle. 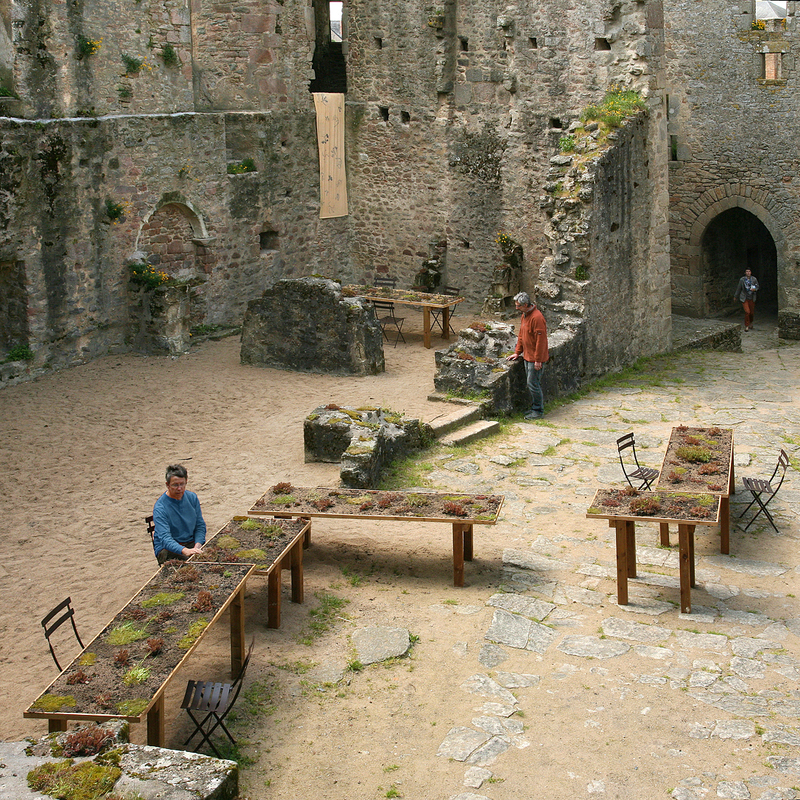 Virginie Bourget and the team of La Garenne Lemot : the gardeners,the personnel and the art mediators of the castle - Amaury Bourget, sound artist - Laurence Caron, herbalist - Bruno Corneille et François Liorzou, teachers form Lycée Jules Rieffel - Guillaume Péron, David Picard and Marek Niel, Thibaut Rivallin, Noémie de la Cotte, assistants - Jean-Louis Vincendeau, historian of the art of gardens - Laurence Neuveu, bookseller - Yoann le Clair, graphist - Close to us: Liliane, Nathalie, Clément, Corentin, Léobin, Bérénice, Elsa, Laëtitia, Olivier, Emmanuelle, Gilbert, Johann, Léo, Anne, Louann, Luc, Michel, Alain, Pascale. 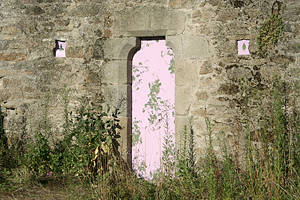 Gilles Bruni goes for a walk in the castle of Clisson squatted very close to the soil to notice and to accompany the rarer or common plant which came here spontaneously. He is not here incidentally, for more than twenty years he accomplishes environmental installations with Marc Babarit then the only one or in new companies in France or abroad. 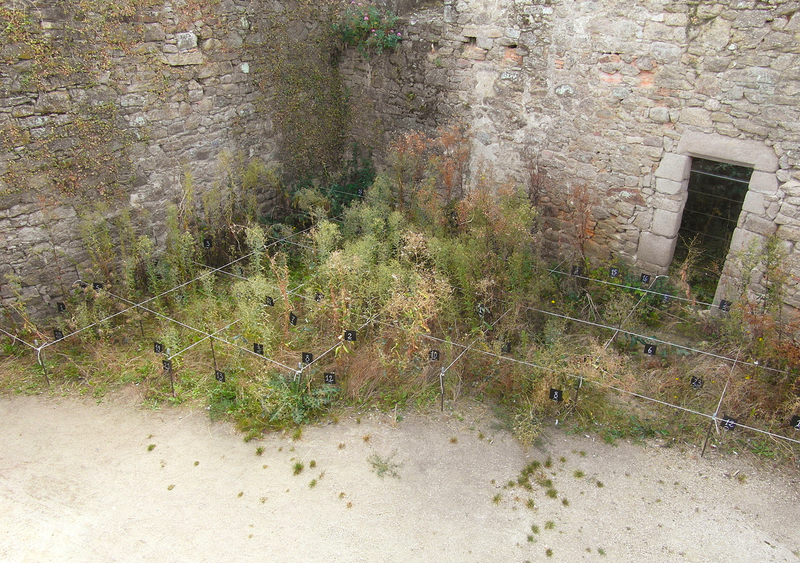 On the occasion of artists' residence in the castle he is in moat or elsewhere in search of advantageous places to be revealed in what he names a "vegetal Arrangement".. Minimal, respectful interventions of the place and what saw in fervent consent and reception of the most modest plants there, he does not search the spectacular it is least that it is possible to say, some "micro landscapes" are even qualified as "almost invisible". For this time he is accompanied by Arnaud de la Cotte and this experience is progressive over several years, one " work in progress " therefore which leaves in plants the necessary time to be known several seasons to become established on their good place. Good surprise: one of the plants met there recalls in his name the Rome's ruin, (Cymbalaria muralis, particularly named Ruins of Rome), when poem joins botany. An important part of this job is listening and exchanges with the users of the place, the public but also of course the gardeners; respectful listening of job and pedagogic explanation which is appropriate.